Looking down at my table at the St. Louis Small Press Expo , I realized I had a lot to say about Louisiana, where I have lived for a total of 11 years, and New Hampshire, where I grew up. But there was nothing about the 4 years I had just spent in California. I finished Where You From? #5 the night before I left for St. Louis. I literally brought to the copy shop 15 minutes before closing and they let me stay late. I drove back across town, go ice cream for dinner and then started folding. Along with this new zine, I had also finally restocked every zine I thought was worth sharing. My friend Kate showed up and at midnight, she was stuffing the riso printed maps in the back pocket of the zine. We slept and in the morning I left for St. Louis. A thing that should remain firmly bolted to the engine block of my loved and tested truck was not bolted at all and was bopping around under the hood, sending very confusing signals to the engine. After some internet scrolling, some advice to "get some gorilla glue and glue that sumabitch down" and then the most elaborate and effective use of zip ties I've ever seen, I rolled into an auto parts store 10 miles back in Arkansas and replaced the part. It seems filling actually that as I broke down en route to share a zine about commuting. Also fitting that I fixed it and rolled on, arriving in St. Louis just in time to set up a table in a beautiful library and talk about zines all day. 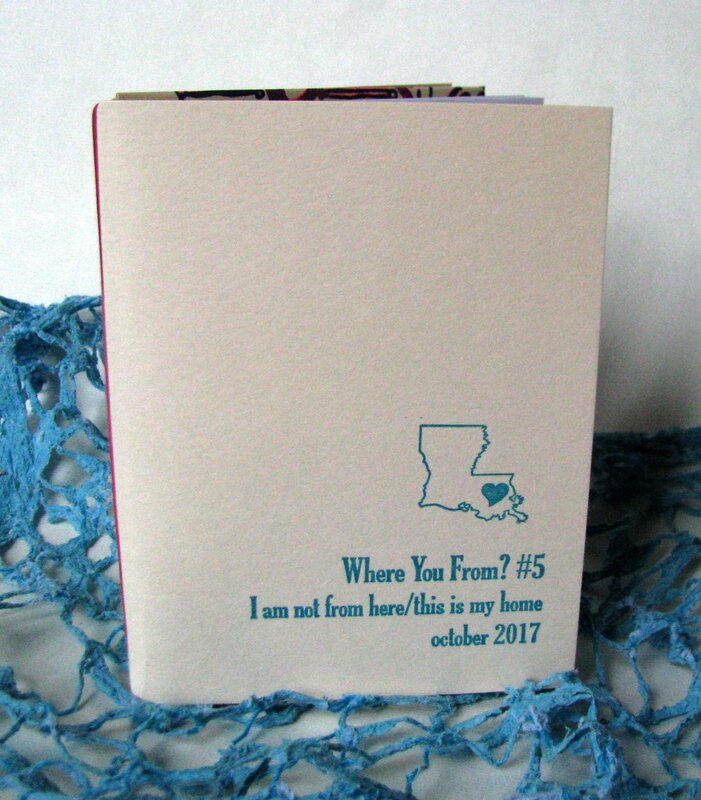 Where You From ?#5 is about moving back to Louisiana, about feeling like you are going home, about making your way in a place with so much personal history. All in the guise of being about commuting. It includes a pull out 2 color map of the route between New Orleans and Baton Rouge, complete with photographs of points of interest. It is about birds, alternate roots, trying to be something you are not, and the ways we learn about a home. It is much more about why I moved back to Louisiana and much less about why I left California. Spoiler: I am not a commuter any more. I tried. I take the truck for long drives and we still go to Baton Rouge about once or twice a month. I've never been much of a driver. Want to read more? You can get a copy of Where You From ?#5 right here along with back issues 1-4 and a few issues of Keep Loving Keep Fighting. My Dad flew from Tennessee to visit last week. As it was his first visit to see me in the Bay Area, he went along with any idea I had. When I was learning to drive I remember that my Dad would let me play whatever music I wanted to listen to. He even would try to hum along and get into it. It is very sweet to know my Dad would sit through hours of Ned's Atomic Dustbin and the Pixes AND let me drive. Lucky for my dad, I was a little more considerate of his tastes. However, I was interested in visiting the diRosa in Napa, not sure what to expect or what my dad would think of a modern art collection. You have to get a tour to see most of the work but we spend a little bit in a gallery, took a walk to the sculpture meadow, and toured the house. There is a site-specific video installation of the changing light through a stained glass window at Chartres. It was the second time in a week I spend a few minutes contemplating a part of that cathedral, a coincidence that was not lost on me. (Chartres is also home to a large labyrinth I had recently learned about). Oakland friends who like conceptual art: this collection is packed with lovely discoveries. The owner passed away a few years ago, leaving his collection open to the public. And if you have an Oakland library card, you can see it for free. I will let the photos explain the rest. There are paintings, sculpture and conceptual work, and enough of it has a sacred, quiet, contemplative feeling that made it feel a little like its own church of art. Go. And take me back. the bottle chapel. we may have snuck back after the tour to sit inside.